Addmen OMR Answer Sheet Checker allows for quick and easy processing of information collected from OMR sheet scans. It is used by most universities, academic institutions, and many IT firms and recruitment agencies for performing OMR test evaluations. The OMR software solution lets you design an MCQ based aptitude test from the scratch. Input the test parameters in the design module, and define the coordinates of its image components for placement of OCR blocks, alpha-numeric blocks, matrix blocks, question blocks, and other required field objects as per the test pattern. Templates you design with maximum number of questions can be used for tests with lesser amount of questions too. A simplified test definition panel lets you define the test parameters with ease. Use the panel to set the title and the date of the exam, allocate topic-wise sections, and to define the number of questions. The software can be used to create (alpha-numeric) multiple choice questions, column matching exercises, and True or False questions. Tests designed can be effectively saved under a unique test ID. Also, pre-defined, ready-to-use test sheet templates are available in both the standard and the advanced version, which can be quickly edited for different test layouts and saved for printing and future use. Setting the answers for the questions is easy – you can manually enter the answers in the answer key panel, or you can scan an OMR sheet containing the answers and read it using the software. Incorrectly set answer keys can be conveniently changed at any point of time, but the sheets that were read with the wrong answer keys will need to be rescanned by the software. Addmen OMR Answer Sheet Checker recognizes complex decimal scoring systems used for critically evaluating the eligibility of the candidates appearing for defense examinations, engineering entrance tests like IIT JEE, GATE etc. You can also define cut off marks, negative scoring, and also set bonus marks for incorrect or cancelled questions. The reading utility allows for effective reading of scanned OMR test sheets. 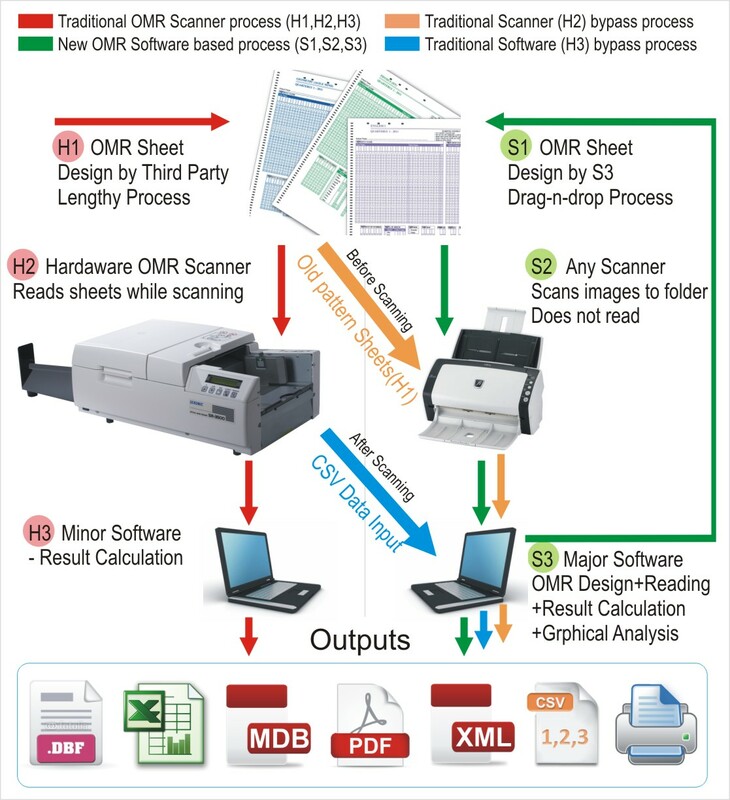 Unlike the OMR scanners, the software is not limited to reading only certain types of paper. It reads the scanned images from all the sheets irrespective of their paper quality. The auto-aligner utility comes handy while reading tilted scans and can rectify images that are rotated up to 180 degrees. Multiple sheets with different test layouts can also be processed in the same session, and the total number of sheets to be read does not affect the accuracy of sheet reading and data collection. Additional customizations in the advanced version allows for reading speeds up to 10000 sheets per hour in the auto mode, not considering the sheets that are rejected for errors. Rejections may occur due to simple errors present in the sheets, such as double answers, blank or incorrect roll no. etc, but they can be easily processed in the manual mode by inputting separate instructions. The reading utility detects only the information from the sheets that are relevant for statistical analysis and results generation. Data such as candidate signature, photograph, and contact details etc are not processed, which reduces the data processing time and further brings down the scope of errors. The data collected is then uploaded onto the central server in encrypted formats like XML etc, for analytical correlation and generation of statistical reports. Results are processed in no time and are uploaded back onto the user’s terminal server for exporting in various formats (Excel, PDF, Access etc).